Ellen Rogin, CPA, CFP®: Co-author of the New York Times bestselling book: "Picture Your Prosperity: Smart Money Moves to Turn Your Vision into Reality"
Ellen Rogin, CPA, CFP®, is the co-author of the New York Times bestselling book: Picture Your Prosperity: Smart Money Moves to Turn Your Vision into Reality. Ellen is founder of the Abundance Activist® movement, on a mission to help the world think and act more prosperously. A financial advisor, she combines her credentialed experience (CPA, CFP®, MBA and a successful business owner) with her years of study into personal growth, visualization techniques, meditation, and yoga to bring a unique approach to the subjects of prosperity, success, and happiness. She speaks as easily about the power of compound interest as she does about the power of belief. Ellen has appeared on PBS Nightly Business Report, CNBC and WGN TV in Chicago, presented at TEDx Seven Mile Beach, Cayman Islands, and has been interviewed on NPR Marketplace Weekend. Her work has been quoted in such national publications as The New York Times, Money, Time.com, Forbes.com, The Huffington Post, and US News and World Report. Ellen is the founder and president of a Chicago area wealth management firm. She earned her MBA from New York University and her BA in economics from Newcomb College, Tulane University. Ellen lives in the suburbs of Chicago with her husband Steven, their two children, and their very large golden-doodle Ruby. My “superpower” is helping people feel calmer about their money and finances. People can get so freaked out about money – but worry is a terrible financial strategy. Calm around money leads to much better decisions, better relationships and increased happiness. I have a unique combination of a credentialed financial background and an integrated, spiritual, creative approach to money. It’s really about balancing the typical “left brain” material approach of money with the “right brain” ethereal approach. It’s about honoring both. Knowing the analytics and practical approaches to money are important, as is cultivating our intuitive, creative abilities as path to using money as a force for good in life. Combining both the material and ethereal is where the magic happens – the path to creating true prosperity. How will you stay the best? The obvious answer to me is a commitment to continuous life-long personal growth. If you stop growing you whither. For me this is a blast. There are so many ways to continue to expand: travel, meeting a fascinating person, taking a course, reading a new book. What could be more fun than a joyous pursuit of continuous learning and self-introspection?! Raising two amazing teen-agers. Our son Benjy and daughter Amy are rock-stars in my eyes. They are happy, bright, athletic, successful students who have learned to manifest amazing in things in their lives. They are committed to personal excellence while making a difference in the lives of others at the same time. As a financial advisor I feel great that they are good savers and charitable with the earnings from their summer jobs. Business: to guide and inspire millions of people to use money as a force for good in the world. I’m especially excited to help women stand in their power around money. In the next 20 years more than $25 trillion will transfer into the control of women. If just 10% of this was used for positive change so many of the world’s problems could be solved. World hunger could end, every child on the planet could be educated and money for research on Alzheimer’s, autism and breast cancer could increase 1000% fold just to name a few. My first thought is the financial crisis in 2008. I had a lot of worried clients, friends and staff. This was also one of the best times. I realized quickly that there was nothing I could do about the markets plummeting but I could find the gifts. 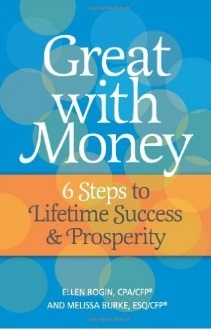 People needed advice more than ever and my first book (Great with Money) came out that year. I truly believe that every setback is a gift wrapped in ugly paper. How our thinking and beliefs create our reality. I’m so intrigued by the power of our minds. It feels like magic to me how what we think and what we say to ourselves, along with the right inspired actions, can create results. What goes around comes around. I do my best to live my life walking my talk around this one. This isn’t a product – but having TSA pre-check is awesome. I smile every time I go through security at the airport. I’ve taken up cycling. I was a committed runner (running in multiple marathons) and my husband is a cyclist. It seemed silly to me we were spending so much time training with other people. So, this past year I bought a bike and committed to riding in the PanMass Challenge – a 192 mile charity bike ride to raise money for Dana Farber Cancer Research. It was tough, rewarding and a wonderful for my marriage!